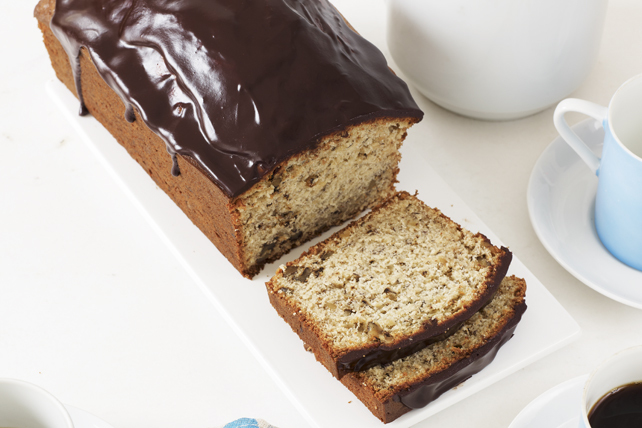 Rare is the person who declines when asked: Want some chocolate with your banana bread? This one's glazed with a mix of chocolate and whipping cream. Combine flour, baking powder and baking soda. Beat butter and sugar in large bowl with mixer until blended. Add bananas, sour cream and eggs; mix well. Add flour mixture; mix just until moistened. Stir in nuts. Cook chocolate and cream in small saucepan on low heat 3 to 5 min. or until chocolate is completely melted, stirring frequently. Cool 5 min. or until slightly thickened. Drizzle over bread; let stand until firm. Prepare batter as directed; spoon into 16 paper-lined muffin cups. Bake 22 to 24 min. or until toothpick inserted in centres comes out clean. Cool in pans 5 min. Remove to wire racks; cool completely. Drizzle with chocolate glaze as directed. Prepare batter as directed; pour into 5 (6x3-inch) foil pans sprayed with cooking spray. Bake 30 min. or until toothpick inserted in centres comes out clean. Cool, then drizzle with chocolate glaze as directed. Makes 15 servings.